Often we think that to be successful, strong, good people, we need to control ourselves each and every day, we need to control our habits, our will power, and we need to control our behavior. Actually, it can often be to the contrary. People who are successful at things often understand human behavior enough to ‘let go’ of aspects of their choices/behavior/habits/routine to others. Like a fitness coach – someone who holds you accountable at the gym to show up, eat better, do the routine as it should be done, etc. Sure you can go solo and do it cheaper but it’s a little harder getting out of bed, showing up, and doing it all 100% when you’re on your own versus when there is someone coaching you. Like a financial advisor – whether it is a planner, advisor, whatever – it helps to have someone there to talk about your financial decisions so that you don’t react and make them purely based on emotions, so that you look at the big picture, so that you stick to your plan. Again it may seem like doing it alone is feasible, and it can be, but when the market crashes or when you have a major life event, your decision process can be clouded (I can vouch for that – unemployment, loss of family members will do that). Actually sometimes an advisor can actually save you money in some cases versus some choices. Certainly a life coach or success coach, or whatever you want to call them, acts the same way. . Plus you gain from all of their experience and resources – and all of their clients’s experiences! Certainly a good friend can help instead of a coach – maybe even a two-way relationship. Make sure that friend can speak freely without ruffling your feathers or feelings. A coach or friend sometimes needs to speak frankly! So it isn’t a weakness to ask for help, to have someone remind you, to have someone help you act better. Actors, athletes, doctors, millionaires and other successful people do it all the time. Taking the temptation away, helping make your life ‘goof-proof’, helping yourself be more disciplined isn’t a solo job – get a coach or friend to help. This month is the 40th anniversary of Enter The Dragon, starring the one and only Bruce Lee. Of course, Bruce Lee is best known for his martial arts and movies. He was one of the best and in some ways, still is. Bruce Lee inspired so many people in the ways of martial arts and fitness. However, all too often, people stop there – they think that Bruce was just about movies; specifically action movies with violence – or that he was just a “martial arts/karate guy”. Bruce Lee went to college and studied philosophy. He was lifelong student of philosophy and wrote and spoke about it often. Bruce Lee developed an art that was particular to him and he called it Jeet Kune Do (JKD). Translated Jeet Kune Do means the “Way of the Intercepting Fist” . One of the key things about Bruce’s philosophy and martial arts was “Using no way as way, having no limitation as limitation”. The techniques of JKD apply to real life situations and real combat. You can apply the philosophy to life, to investing, to fitness, art, etc. There is an inherent harmony or balance in the philosophy. Bruce Lee was a small business owner; starting martial arts studios. He was an action hero and movie star. His philosophy encouraged simplicity and simple systems as well as a quest and the pursuit of perfection and mastery. One of the most important influences on Bruce was his exposure to Taoist philosophy. Taoist philosophy is the development of the Chinese sage Lao Tzu, who in the sixth century BC wrote the definitive work on the subject, the Tao Te Ching. In 1963 Bruce published a book titled Chinese Gung Fu: The Philosophical Art of Self-Defense. The book expressed his views on gung fu as well as his deep interest in the philosophical aspects of martial arts training. #10 “Be a practical dreamer backed by action”. There are a lot of dreamers out there, and countless people working their hard at their job. But it’s only those who do both, dream big AND act big that really shine and change the world. Choose to be one of them. Time-management & Personal Productivity are hot topic these days. If you haven’t already, I urge you to make this something you strive to get better at. This is one of the utmost principles of Optimal Living. Learning is not something we do only in a classroom. It’s something we do everyday, as we try new things, analyse the results, and constantly tweak how we think and act. And that’s how we evolve and get better at life. Willpower is the engine behind living a great life and making things happen. The good news, it can trained and developed. In new his book aptly named “Willpower”, Florida State University Professor Roy Baumeister tells us: “If you exercise it, you can make it stronger. There’s nothing magical about it.’’ How do we do that? Best way I’ve found: take on The 30 Day Cold Shower Challenge. Everyday, stuff happens. Some is awesome, some… not so much. I’ve personally developed a strong faith that everything happens for a reason, and as Steve Jobs says, we simply can’t connect the dots forward. When something bad happens to me, I make it a game of seeing how quickly I can start looking at it in a positive lights, and even turn it into an opportunity. Persistence, persistence, persistence. It’s without a doubt one of the most essential human traits for life excellence. It’s a better predictor than talent and intelligence in the quality of the life we create. Whenever I get scared about my plans to start a business next year, I remind myself that failure is impossible because I simply won’t give up until I make it work and achieve my goals. Plain and simple. We each can offer wonderful gifts to the world but do so, we need to let our through colours shine through. Sadly, we live in a society that makes this way harder than it should be, but the truth is that we’re all unique beings, and we should embrace our uniqueness, not hide it. So live for yourself, do what feels right to you, and don’t worry about what other think. Concentration is a lost art in today’s world. Distractions come in more shape and forms than ever before, and this is affecting many of us. But without concentration, nothing great gets done. In my opinion, the best way to build our concentration ability is without a doubt the daily practice of meditation. We all have these phases when we get all caught up in our own stuff (I’m certainly prone to that), but we need to keep remembering ourselves that, happiness is rooted in helping others“. Sometimes, it’s good to pause and reflect on how we’re living, and whether we’re really offering our full gifts to the world. A little bonus: It’s been shown that whenever we help someone, it significantly boosts our levels of serotonin, one of the main feel good neurotransmitters in our brain). It also boost the serotonin of the person we help, AND anyone watching our good deed. How cool is that! We are in control of our life. We write our own story, and and everyday, through all the small decisions we make, we shape ourselves into the best version of ourself, or a diluted version of it. Bruce’s philosophy can be summarized here well….. The core philosophy of Bruce Lee was to “know yourself.” It is clear that all the avenues Lee took in life were in pursuit of self-cultivation, which leads to the ultimate destination: self-knowledge. His art and philosophy were the vehicles he used to gain an understanding of himself, to feel and fully appreciate the experience of what it means to be a human being. To achieve that, he spent countless hours learning, training, reading and researching. Bruce Lee had so many great strategies and wisdom; most ahead of his time. He inspires hedge fund managers, movie stars, teachers, fitness coaches, leaders, children, young and old. · Jeet Kune Do does not beat around the bush. It does not take winding detours. It follows a straight line to the objective. Simplicity is the shortest distance between two points. · The art of Jeet Kune Do is simply to simplify. · The man who is really serious, with the urge to find out what truth is, has no style at all. He lives only in what is. So, like you should with anyone, the next time you see Bruce Lee on TV, remember not to limit him and be inspired by his work at bettering himself, at his quest for self-actualization, his leadership, his faith in himself and others, his growth, his belief systems, his constant proactive nature, his philosophy and commitment to follow his own way. Wishes to you for finding simplicity and balance in your life. In this blog post: How you can change a negative situation or relationship….and how you can focus on the goal instead of the obstacle….and working with the emotional and logical parts inside You….. 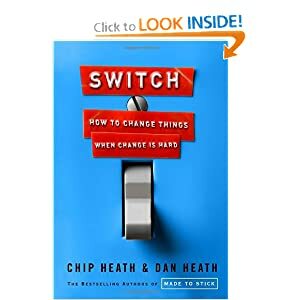 I am reading the book “Switch” by Chip and Dan Heath. I recommend that you read it. It discusses a number of great ideas related to change, changing habits, planning and how we humans approach life, and how we can make changes better – both personally and at an organizational level. In their own words the Heath brothers summarize the book as such: “It puzzled us–why do some huge changes, like marriage, come joyously, while some trivial changes, like submitting an expense report on time, meet fierce resistance? We found the answer in the research of some brilliant psychologists who’d discovered that people have two separate “systems” in their brains—a rational system and an emotional system. The rational system is a thoughtful, logical planner. The emotional system is, well, emotional—and impulsive and instinctual. When these two systems are in alignment, change can come quickly and easily (as when a dreamy-eyed couple gets married). When they’re not, change can be grueling (as anyone who has struggled with a diet can attest). SOLUTIONS BASED THERAPY: Therapy is often a good thing for us humans. Since you and I are human, let’s talk about that. We go in and talk, bring out our ‘issues’ and get things off our chest. Therapy helps many, many people. The book discusses how traditional therapy is different from solutions based therapy. In traditional therapy we dig into our past, look at our childhood and dig out all the reasons why we are the way we are. The book suggests, partially in jest, that “after $50,000 and years of therapy you can now blame your mother.” This is not to say traditional therapy doesn’t work, it often does. However, my discussion today is focused on the other type – solutions based therapy. These types of therapists don’t typically dig into your past. They don’t find out if your dad didn’t hug you enough or if you were scared of bats. Solutions based therapy does what it says, they provide you a solution. If you’ve got a problem, let’s work on a solution, right now. OK, go do it. Example: A married couple is angry, tense, and having issues. They aren’t getting along well. They are arguing a lot, not intimate nearly as much as they want to be, they are unhappy and there is a daily struggle. The tension and arguing are affecting the kids and both spouses are feeling it. So a solutions based therapist doesn’t go to the wife and see if she has ‘daddy issues’ nor would the therapist do the same for the husband. Typically then the spouse would respond by saying that they’d feel happy, at ease, and that they’d be more pleasant to the other spouse, more relaxed. The therapist also asks questions like “What would you want to see instead?” It is key to find a replacement behavior and/or habit for anything negative. It is much harder to say not to do “that” – it is easier to say to do something else instead. Often the spouse responds by saying something like their mate would be listening after they woke up. The therapist would continue “How could you tell that your spouse was listening?” It asks them to identify the results what they want, expectations are clearer, clarity helps all parties. There is then an end result in mind. The miracle itself is irrelevant and not discussed. This is a wonderful approach not only to therapy but to our daily lives. Ask a better question, find a solution and take action. Some people think this is too simple. After the above exercise and questions are asked, the authors suggest a second pivot question: “When was the last time that you saw even a little bit of the miracle, even just for a short time?” Then you replay the scene when things were working for you. What was happening? How did you behave? Were you smiling? How did you feel? Solutions based therapists “learn to focus their patients on the first hints of the miracle…Pretty cool, right? What if you wrote this type of open ended question down and carried it with you each day? What if you tried to apply it to your daily life – your relationships? Career? Health? It gets you focusing on the ‘good stuff’ instead of what isn’t working. It gets you looking at how we can improve things, how we can solve a problem, rather than just talk about it and think about it (even more). There are many great things in the book Switch but I think this chapter is very valuable. I may riff about other parts but this one is worth being a solo post. OK, you’ve read other blog postings of mine, can I ask you to listen to a quick story? Would you picture something for a moment? See a father of two beautiful daughters, great loving wife, who used to make a bunch of money, in his house. See that guy in his 40’s as a caring, dynamic person who was successful. The economy changed, he made choices and suddenly, it seemed, he made a lot less money. He is sitting on the couch peering into the distance, blankly staring. His daughter asks him something but he misses it first, she asks again and he gives her a terse response, and later feels bad about it. NO reason to do that, he thinks. Now the mortgage was a little too high, the tuition was a little too high. The ‘gap’ between the income coming in and the expenses going out was very, very small. Sometimes it was negative. Debt became a huge factor and fear. In the mornings he would wake early, lie in bed and get a tight feeling in his chest. He sometimes got an upset stomach, and sometimes even felt like throwing up. This guy, who typically was happy, confident, easy going, fun to be with, was now an anxious guy, lacking confidence, lacking his patience and humor. He felt bad. He felt like he let his family down. He felt like he got to where he was in life and had nothing to show for it. He was scared, uncertain, nervous. Picture our dad at a party with other families. Everyone is having fun, our guy is somewhat withdrawn. Typically he is engaged and joking, meeting new people, reconnecting with old friends. See our guy hanging back at the party. Notice his posture. Notice his face. When you shake his hand and say hello, notice how he speaks, how he looks at you and looks away. How does he interact with you? Imagine seeing our guy at a party. Notice his posture. Notice his face. When you shake his hand and say hello, notice how he speaks, how he looks at you and looks away. How does he interact with you? How is he dressed? Would you take a moment and imagine one other brief story? Picture our good father and husband again. All the above is true. It happened, and it is in the past.Hear him humming an upbeat song from the radio that his daughters love to dance to….he gets a little smirk on his facing thinking about it. Our guy has some good friends and family around him. Imagine him sitting with some friends and getting some good support, some ideas, some connections. He is having a good time talking and laughing a bit. See our guy in front of his computer getting emails about networking, about a place to send a resume, about a new opportunity. See our trusty dad and good guy talking with connections on the phone. One quick, casual conversation uncovers a business opportunity. It seems like a great fit. See our guy excited. He sits up a little straighter. He has more confidence. He is thinking about the future and the future is brighter. Instead of negative worrying, he is thinking of ideas how to solve problems, improve things, improve his finances. His face seems different. He is more focused and driven. He does smile more often. He has a purpose. He reflects that he put himself where he is and accepts where he is, he also accepts responsibility and doesn’t blame the economy or others like he sometimes did before. He spends a little more time eating right, exercising, and even tries to dress a little better. Picture a toned dad, trim, in some stylish yet casual clothes. See him and his wife talking about the budget, working in front of a spreadsheet. They’re excited about paying off a credit card that has been around for too long. Now that couple hundred dollars is available to pay off something else, for reserves, for a fun fund, or whatever. Notice the relief and calm that has returned to his face. There is another summer party with the families again. Many of the same people are there and new people attend. It is a nice night, a great party with twinkle lights in the background. People are interacting, talking, laughing while the kids play. There is some corn, chicken and beef on the grill. You catch a whiff of the food and it smells great. You hear some music in the background softly playing. Maybe it is a Bob Marley song? Our dad is there at the party. Life still isn’t perfect but his attitude seems to have changed.You walk over and greet him again. Notice how he stands differently. His posture. 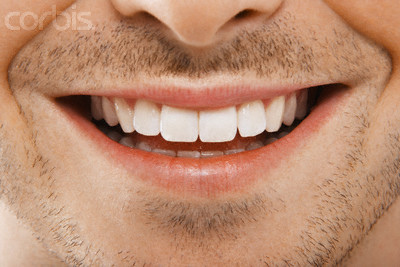 His smile? Notice how his handshake, eye contact, and confidence seem this time. He throws in some humor. He has a good smile. What is he wearing? Does he have a different “feel” about him? His voice has a strong tone to it. He sounds confident. He asks more about your life this time. He is more engaged and listens to what you say. Our guy shares an idea about something in your life; it is a helpful idea, something he recently read and it could actually be something you could really consider. You’re happy to hear about it. You talk more and there is a good feeling going on. You ask him about his life and he comes across as being very grateful for things. He is happy with what he has in life; friends, family, home, work, income. He feels like celebrating, he says. He is upbeat about the future. Were you able to read that OK? Maybe these weren’t great stories but you were interested for a little while right? You were able to imagine these things weren’t you? You had a story, a movie playing in your mind. You now have an image of “our guy”. You probably have an image of his daughters, his wife, the party, etc. Notice how, especially in the second story, there were details all around, senses, feelings, images, sounds, smells. Emotions are key. I probably should have included more and bigger emotions in the second one. That is visualizing! That is mental imagery. Easy! 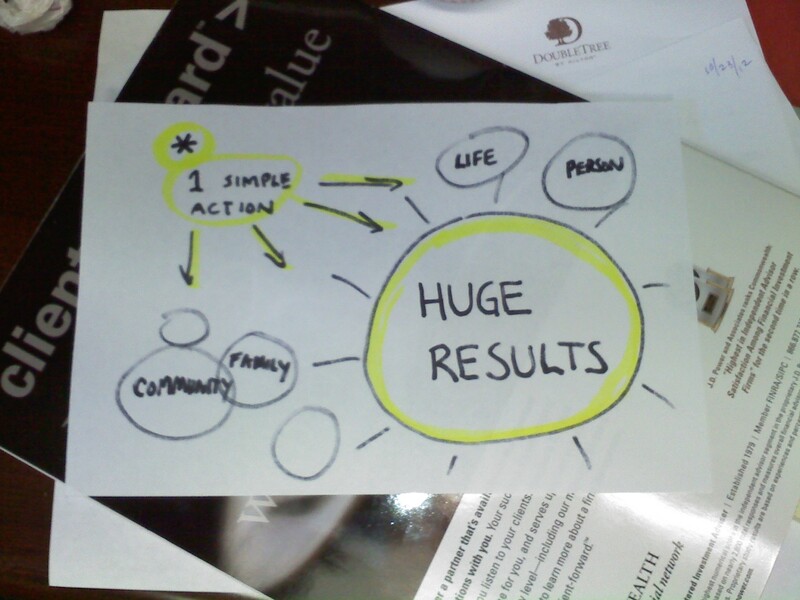 You don’t need a huge Vision Book, some complex outline, and you don’t need to spend 20-30 minutes a day. The Vision Book will help, outlines help, and you can spend more time but 5 minutes a day is fine. Create a story of you already “there”, as if you’ve arrived. Imagine that you got a DVD of you from the future – but this DVD has more features..you can also feel and smell what the future you feels and smells. What are the feelings having accomplished things? How do you feel/look now that you have more income (or whatever)? What is life like? What kind of music is in the background? What kinds of food do you smell? How much are you laughing? Who are you talking with and what does that conversation look like. Write a story about you and have fun.